Cantu® Grow Strong Strengthening Treatment prevents breakage before it starts by penetrating and moisturizing hair from the roots to the tips. 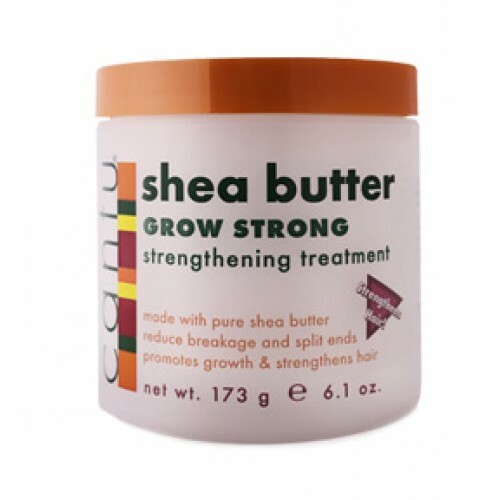 Cantu® Grow Strong Strengthening Treatment is made with pure shea butter and essential oils to replace vital oil to your scalp and in your hair leaving it stronger and healthier with a natural shine. Daily Styling – massage into hair beginning at the roots and working towards the ends. For deeper penetration, leave covered under a plastic cap overnight. Daily Protection – apply before brushing, styling, drying, or setting to form a thermal protection barrier around your hair. Pre/Post Chemical Treatment – apply 3 days prior and 3 days after relaxing or coloring your hair. Click the button below to add the Cantu Shea Butter Grow Strong Strengthening Treatment to your wish list.